Home » Blog » Team Building: The benefits of mobile team building activities! Whether it is indoors or outdoors, part of a company conference, team away day, or a standalone event, mobile team building activities are a cost-effective, fun, and flexible choice. With a huge range of formats and options to choose from, there is guaranteed to be something that suits your budget, available time, and objectives. Let’s take a quick look at some of the key benefits of mobile team building activities. Mobile team building activities are designed to be run pretty much anywhere and will come with all the staff, equipment, and sundries needed for the event. Typically, the venue requirements will be straightforward, and a large room or flat outdoor space is all that’s needed. This opens loads of venue possibilities including hotels, conference centres, meeting rooms, or even your offices! 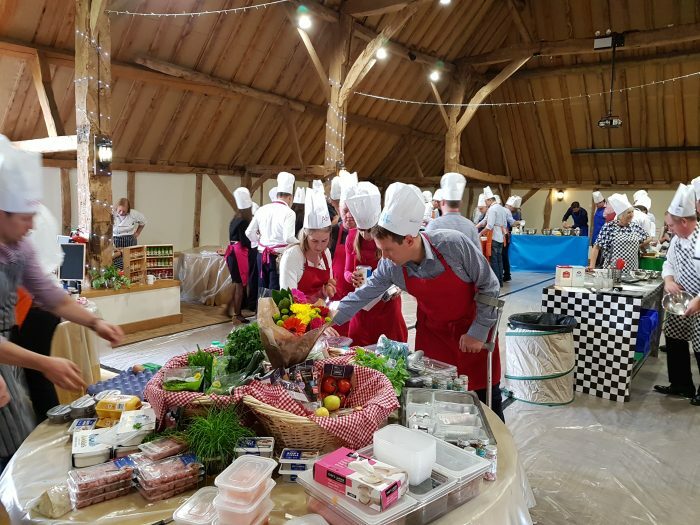 Even cookery team building activities like ‘Strictly Come Dining’ or the ‘Bake Off Challenge’ can be run in a standard meeting or conference room – there is no need for a specialist kitchen. Mobile team building activities aren’t limited to a specific area and can be delivered nationwide (and even internationally if required). This means that you aren’t constrained to using a supplier close to your chosen venue or offices and can make your choice based on the activities provided by a particular team building company rather than their location. Mobile team building activities can easily be fitted in around your meeting or conference with minimal disruption. Whether you want an activity to be run first thing in the morning to energise delegates, after lunch to combat the ‘post-lunch lull’, or in the evening for a bit of fun, everything can be slotted into your agenda seamlessly. Choosing a mobile team building activity that can be easily delivered at your meeting/conference venue or even office, eliminates the need for participants to travel to a separate venue or location for the activity. Not only will this reduce travel costs, it will also enable you to spend more time enjoying your chosen team building activity. All the mobile team building activities are great fun but have also been designed with business in mind. Each activity can be tailored to your specific requirements to ensure you get the most out of your event. Regardless of whether you are simply looking for a fun activity for your team, or have some key deliverables you want to achieve, a mobile team building activity is the perfect choice. This entry was posted in Team Building Activities, Event Organising Tips, Conferences and tagged Team building activities, Corporate Team Building Activities, mobile team building activities, team building company, mobile team building. Bookmark the permalink.